As the end of the year approaches, all boards and managers know it’s time to complete the budgeting process. Most associations begin preliminary budget work in the summer and try to complete and approve the budget by the end of November, so many of you are well into the process. Florida has many technical and legal requirements about the way the budget is presen-ted and what the budgets of community associations must contain, but let’s start with the basic purposes for developing the annual budget. Preparing the annual budget really means preparing two budgets—the operating budget and the reserve budget. The operating budget is a tool to make sure all operational needs are identified and to approximate expenses for the year. The adopted budget is used to establish the maintenance assessments for each unit owner. It is also a method to communicate with the owners about the costs of operating the association. For condominiums, Florida Statutes require budgets to be detailed and show amounts budgeted by accounts and expense classifications. Florida Administrative Rules require that the budget state the common expenses at least annually, show the beginning and ending dates of the period covered by the budget, and show the amount of the assessment for each unit type both annually and monthly (or quarterly if payments are due quarterly). Most managers and treasurers start early to verify the monthly fees with the association’s service providers such as landscaping, security, and maintenance companies. At this time, they find out if there will be increases in utilities billing and they call the insurance agent to get an estimate of the cost to renew insurance policies. The manager will also meet with the board to determine if any one-time maintenance issues need to be addressed in the new budget, and if the amount budgeted for repairs and maintenance in the current budget is expected to remain the same for the coming year. Once the operational budget is completed, the next budget to be addressed is the reserves. 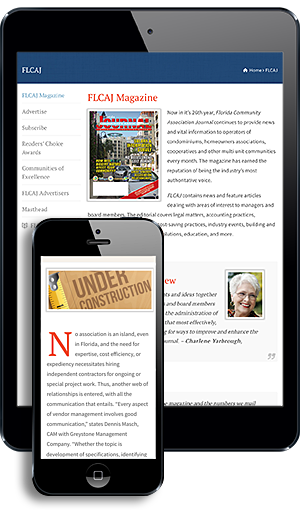 Florida law requires the board to present a fully-funded reserve budget. By statute, condominium reserves must include roof replacement, building painting, pavement resurfacing, and any other item for which deferred maintenance expense or replacement cost exceeds ten thousand dollars. Associations may also establish other reserve accounts if the board deems it necessary. To calculate the amount of reserve funding required, it is necessary to have an estimated replacement cost for the reserve component and its remaining useful life. This information can be hard to determine, so many associations engage an engineering company or reserve analyst to perform a reserve study. The reserve study will ensure that you are working with accurate, current replacement costs and have an accurate estimate of remaining useful life. Each year adjustments must be made to reserve funding requirements to take into account variables like changes in cost, premature deterioration of the component, or maintenance performed which may extend the component’s life. an association, its officers, directors, employees, and agents may not use a debit card issued in the name of the association or billed directly to the association for the payment of any association expense. Use of a debit card issued in the name of an association or billed directly to the association for any expense that is not a lawful obligation of the association may be prosecuted as credit card fraud in accordance with Section 817.61, Florida Statutes. Until 2002, reserves for condominiums had to be shown by the component method (also called straight line), and many associations still use this method for budgeting and funding reserves. For the component method, the association establishes a separate account for each reserve asset. The budget will show the replacement cost of each component, the total useful life, the remaining useful life, and the required funding for the year. The main advantage of the component method is that it is very straight forward and easy to understand. The reserves collected for each component can only be used for that specific item. The fund for that reserve item cannot be used for any other purpose without the approval of the majority of the association members. The main disadvantage to the straight line method is that if a reserve item is underfunded or fails prematurely, the association must either delay the replacement, levy a special assessment to fund the replacement, or have a unit owner vote to use funds collected for another reserve component for the replacement of the item. Since 2002, many condominium associations have switched to the pooled method (also called cash flow method). With pooled reserves, the association has one account to pay for all of the reserve assets. All components are part of the pool, and the annual reserve contribution is determined by the ending balance in the reserve account from the previous year and subtracting that balance from the amount of funds needed to pay reserve expenditures needed for the budget year. Most associations establish a threshold funding, and a reserve fund cannot go below that minimum balance. Pooled reserves must be adequate to ensure that the pooled account will never have a negative ending balance. A reserve study is a necessity when an association opts to use the pooled reserve method. The advantage of pooled reserves is that this method offers maximum flexibility. Funds in the reserve account can be used to cover expenses for any of the reserve assets with no required vote of the membership. The disadvantage of pooled reserves is that the reserve study is harder for unit owners to understand, and a reserve analysis by a professional is highly recommended. No matter which reserve method an association uses, the interest earned on reserve funds remains with the reserves and cannot be used for items in the operating budget. When the budget work is completed, the board must look to its governing documents to determine whether the documents require a unit owner vote to approve the annual budget. In most cases, the budget approval is a responsibility of the board of directors. The proposed budget must be sent to each unit owner with the meeting notice and agenda at least two weeks before the meeting. When the budget has been approved, most associations send out their billing statements. If you are using a bank lockbox for accounts receivable, it is advisable to get your budget approved early so coupons can be mailed out to owners in time for them to make their first payment in January. Most of the associations in Florida have a fiscal year which coincides with the calendar, so remember that about 90 percent of the associations will be ordering coupons for January. The earlier your budget is adopted, the sooner the coupons can be ordered and mailed out to be in the unit owners’ hands before the Christmas mail rush. My hope is that you are finishing your budgeting by the time you read this article, and I wish you a healthy fiscal year. Janet Romano is Senior Vice President of Association Services for Stonegate Bank. Stonegate Bank, the private bank for business, specializes in loans to all types of community associations—condominiums, co-ops, and HOAs. Loans are provided for repairs, mortgages, emergency lines of credit, capital improvements, and insurance premium financing, with low closing costs. For more information, call (866) 227-0441 or visit www.stonegatebank.com.